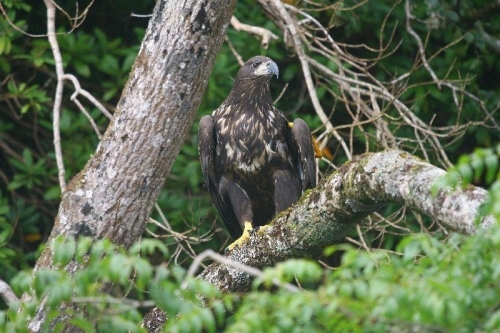 The Golden Eagle Trust, in collaboration with the National Parks and Wildlife Service of the Department of the Environment, and several individuals, propose to reintroduce White-tailed Sea Eagles to Ireland using a well-established methodology. A thorough evaluation of the project in the context of the species’ global range, status, and threats, was completed in 2006, including population modeling to determine the likelihood of success and the number of individuals needed to establishing a viable self-sustaining population. Further, the suitability of Killarney and the coastal environment in Kerry for the species was assessed and endorsed by leading Norwegian sea eagle experts. Southwest Ireland was identified as being the most suitable area for reintroduction and the long-term prospects of population reestablishment. After careful site selection, Killarney National Park, County Kerry, was chosen as the release site likely to give the reintroduction the best chance of success. In summary, the project meets the International Union for Conservation of Nature and Natural Resources (IUCN) criteria governing such programmes, and will fulfill part of the Republic of Ireland's obligation to halt and restore biodiversity losses where appropriate. Reintroducing sea eagles to Ireland promises to be one of the most challenging and exciting conservation projects ever undertaken. As sea eagles take some 5-6 years to mature and breed we expect the first breeding attempts by 2012-2013. Because sea eagles, like other large, long-lived birds such as albatrosses and penguins, have very low breeding rates (see Breeding), establishing a viable population is dependent on low adult mortality. Ultimately, the long-term success of this programme will depend on the goodwill and support of the people of Kerry and West Cork, especially the farming and fishing communities of the Dingle, Iveragh, and Beara peninsulas, where most sea eagles are likely to settle to breed. The Golden Eagle Trust, in collaboration with its partners, will endeavour to work with these communities and others to make the project a success.